Congratulations on your harvest. We would like to provide a few tips for the best care of your animal so your meat will be in the best possible condition. And when your done, if you need a processor, call Pioneer Meats to help. Take pictures then start dressing the animal. 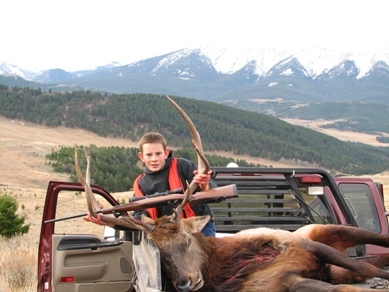 Be sure to remove the lungs and esophagus, especially in elk so the meat can cool properly. Take the entire urinal track and manure from beneath the pelvic bone between the hind quarters. Temperatures above 45 degrees are not cool enough to hang or cool wild game. Quartering your animal, placing it in ice, and making sure that air can get all around the animal are other ideas to help cool your harvest. Get it to your processor for proper cooling. Processors prefer to have all animals, even quarters, with the skin on. Keeping the skin on helps protect the meat from debris and from dragging. Keep the meat clean. Dirt, grass and pine needles will need to be cleaned off to make the meat eatable. Use a tarp or blanket to work on. Never put meat into garbage bags, they are coated with chemicals and pesticides. Use game bags if you are going to skin the animal yourself.